Although not viewed as posing nearly the threat of H5N1, H9N2 infections in humans are worthy of our attention since they appear to be rare, and because the H9N2 virus has a habit of reassorting with other flu viruses. Its internal genes can be found in such novel flu viruses as H5N1, H5N6, and H7N9. 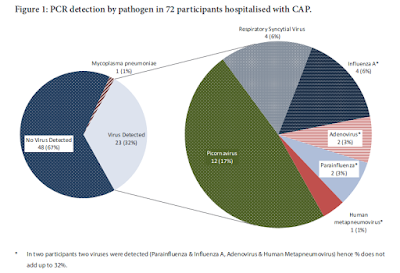 On the positive side, H9N2 infection in humans has generally been mild, and no human-to-human transmission has been detected. It's mild presentation, and the extremely limited amount of testing of mild flu infections globally, makes it difficult to know just how prevalent human infections really are - particularly in Asia and the Middle East - where it is pervasive in poultry. A total of 28 laboratory-confirmed cases of human infection with avian influenza A(H9N2) viruses, none fatal, have been detected globally. In most human cases, the associated disease symptoms have been mild and there has been no evidence of human-to-human transmission. 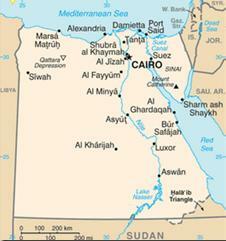 Influenza A(H9N2) viruses are enzootic in poultry populations in parts of Africa, Asia and the Middle East. The majority of viruses that have been sequenced belong to the A/quail/Hong Kong/G1/97 (G1), A/chicken/Beijing/1/94 (Y280/G9), or Eurasian clades. The most complete list of H9N2 we have online can be found at FluTrackers Global Cumulative H9N2 Partial Case List 1998-2016. 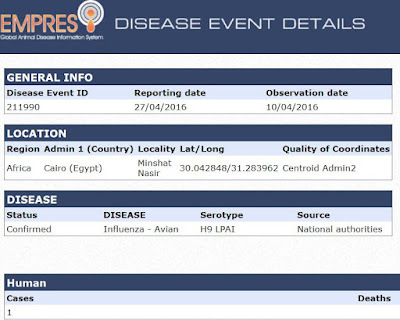 While details are very scant, today we have an FAO notification of a human infection with LPAI H9 (which is presumably, H9N2) in Egypt (see below). With 9 cases reported last year (4 in China, 3 in Egypt, 2 in Bangladesh), 2015 was a record year for H9N2 reports, although this jump may have more to do with Egypt & China ramping up their testing for novel flu viruses, than an actual increase in cases. Whether a standalone H9N2 virus ever poses a pandemic threat or not, it continues to aid and abet in the creation of new, often dangerous, bird flu viruses. That alone makes it worthy of our attention, although any substantial increase in human infection would be of concern as well.